Open: Mid December to mid April... The Hotel De Charme Les Airelles is located in the heart of the " Jardin Alpin " in Courchevel 1850. With 500 kilometers of Slopes, Courchevel belongs to the largest and most popular Ski Terrain in Europe. It offers ski in and ski out capability, since it is located on a slope. 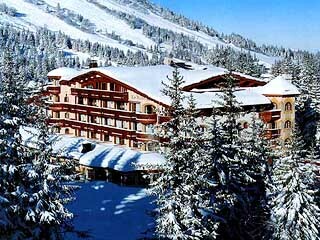 The Hotel De Charme Les Airelles is located in the heart of the " Jardin Alpin " in Courchevel 1850. Every Room in the Hotel is paneled in ancient wood and decorated with exquisite handmade ceramics. With 500 kilometers of Slopes, Courchevel belongs to the largest and most popular Ski Terrain in Europe. It offers ski in and ski out capability, since it is located on a slope. At Les Airelles we aim to recapture the authenticity, style, warmth and hospitality typical of the " Grands Chalets " of the past. Wood and other traditional materials combined with a discreet use up-to-date technology guarantee your every comfort and a truly successful stay. Whether seated under the richly-painted ceiling in the Dining Room, alongside the 12th century Fireplace or outside on the Terrace, " La Table Du Jardin Alpin ", the Hotel's Restaurant, provides the perfect rendez vous with " the art of good living ". The Chef and his team will treat you with their specialties. " Le Coin Savoyard ", the charmingly rustic, wood-paneled Restaurant specializes in regional dishes. From the slopes, through " La Gloriette " you have direct access to the sun drenched Les Airelles Terrace for a Buffet Lunch. The Receptionists and the Concierge, Gilbert, " l' Homme aux Chefs d'Or ", will look after your bookings and your every need throughout your stay. The Health Club will help you keep in shape. And then you can visit the Hairdressing Salon. The " Valet Skiers " is entirely at your disposal to take care of your ski equipment. The direct access from the slopes to the Airelles fairy universe by the " Gloriette ", guided by the " Skiers Valet " from the " Relais Des Skieurs " to the " Table Du Jardin Alpin ", a well known Gastronomic place. A great time and an awaited moment by the children, the Carnival at the Hotel with it's sumptuous Buffets, brings pleasure to are little hosts. Thematic Evenings: there is always something special happening at Les Airelles and the atmosphere is guaranteed on evenings like Rondo Veneziano, Jazz Time, etc. The Hotel consists of 52 Rooms ( Standard & Deluxe ) and 4 Suites ( 1 Bedroom or 2 Bedroom Suites, Skier Suite & Private Suite ). All the Rooms & Suites include Direct Dial Telephone Lines, several National and International Television Channels and Closed Circuit Video Programs, Mini Bars and Safe Boxes. Every Bathroom is decorated with painted tiles and handmade, enameled lava wash tables, all of which have been exclusively designed for the Hotel. The Suites, based on themes, fresh water fountain, ancient sculptured wood ceilings, wrought-iron artwork - all these especially conceived details are a witness to the quality of our welcome. New for the 2001 winter season, the " Suite Du Skieur " all of wood, wall paintings and decorative frescos.